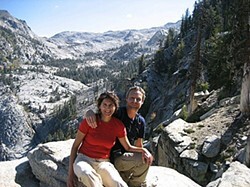 Pieter and Sara in Sequoia National Park granite. The fish is the last to see the water. I was recently reminded of this aphorism (from anthropologist Ruth Benedict) on receiving an e-mail from our Dutch friend Pieter in response to our question, Why do you keep vacationing in the U.S.? His reply reminded me that after 40 years living on the West Coast, I've started to take it for granted. We first met Pieter and his Spanish wife Sara eight years ago in Cuba. 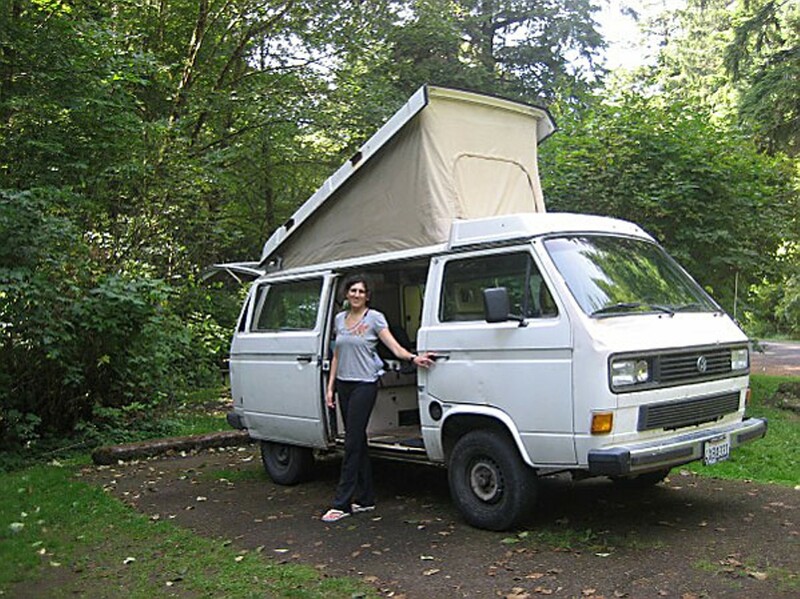 Last month they borrowed our faithful 23-year old "Westy" VW camper to tour northern California and Oregon. "The main reason we like to travel in the U.S. is the nature and the accessibility of it," writes Pieter. "Sure, we have beautiful nature in Europe, but it's not as extensive, varied and rough as in the U.S."
"We're fascinated by the way people live in the small towns ...with a general store, a hardware store and a motel with a run-down sign, where everyone drives a pick-up, the men wear camouflage outfits, and trailers with American flags are parked on the outskirts of town. These places seem so detached of the rest of the world ..."
Then there's the driving: "We don't have a car in Amsterdam, but we do love driving. If, occasionally, we do drive over here, we find the roads are crowded and traffic is heavy, no fun at all. Nothing beats driving down an empty road with spectacular views, endless miles between two towns, and the stereo blasting out Dylan or Johnny Cash. Yeah!" "Sara and I are very much into recent history: reading novelists like Steinbeck and accounts of the Oregon Trail, the Gold Rush and the Dust Bowl; listening to Woody Guthrie; looking at Dorothea Lange's photographs. What fascinates us is that American history is so young and that the country is such a mixture of descents. You can be in a town that didn't exist a hundred years ago, and speak with someone with Italian grandparents on one side and a Russian grandmother and Bulgarian grandfather on the other side. "Most Americans we meet don't seem to be as attached to a geographical location as they are in Europe. Over here, I'm considered 'far from home' because I moved from my birth village to Amsterdam, and most of the people I went to high school with are still living in the same area. People in Europe generally stay put, whereas in the U.S. we often hear something like 'I was born in New Jersey, then studied in Chicago, worked for a while in Texas before I moved to California, and now I'm applying for a job in Washington.' All this gives us a feeling of being in 'The New World,' where people take chances and are exploring new territories." Then there's the myth of the U.S. versus the reality. "As a child I played Cowboys and Indians, acting out the children's books about the Wild West. I remember seeing pictures of the Grand Canyon and the Empire State Building in our first encyclopedias ... I grew up listening to The Stones getting their kicks on Route 66 and Crosby, Stills, Nash & Young singing about Woodstock. I saw hundreds of Hollywood movies, documentaries on TV about newspaper boys who became millionaires, reading about Led Zeppelin living like kings on Sunset Strip, Jack Kerouac breaking society's laws, hip hop from the East Coast and speed metal from the Bay Area. Of course, getting older, I realized the U.S. is not the promised land -- and I don't agree with most of its politics -- but still there's a very strong subconscious image in my mind that makes me want to go there and be part of it. "A few weeks ago I read a Dutch writer who said, 'There's the United States, a country like any other, people living normal lives, nothing special ... and then there's America: an image everyone in Europe knows and longs for.'" Pieter concludes, "Traveling in the U.S. is easy, fun, and the exchange rate is good!" Barry Evans (barryevans9@yahoo.com) remembers seeing a TV margarine commercial featuring the wonders of California on British TV when he was a kid, which is probably why he now lives in the Golden State.